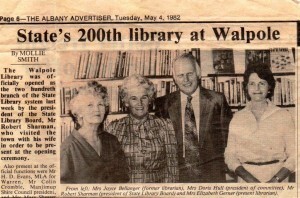 In May 1982 the Walpole library became the 200th State Library. This milestone brought the then president of the State Library Board, Mr Robert Sharman, to the town for the official function to recognise this status. Also present were Mr HD Evans (MLA for Warren) Mr Colin Crombie (Manjimup Shire President) and Mrs Mary Shearer of the Library Board and former State President of the CWA. Another special guest was Mrs Joyce Bellanger, a former librarian of Walpole who had moved to the metropolitan area. Mrs Bellanger recalled that when she took on the job of librarian she needed assistance and this was readily given by Mrs Mollie Burnside. Between them they purchased and listed books. Mrs Burnside was still a member of the library committee at this time. Unfortunately the other librarian who held office, Mrs Clare Swarbrick, was unable to be present. The function was opened by Mr Thomas Gerner who introduced Mrs Doris Hull who had chaired the inaugural meeting to establish the library and had held the position of president for 20 years. Mrs Hull acknowledged the support the committee had received in the upgrading of its premises from the Manjimup Shire Council who had contributed $5000, and from members of the community. She paid tribute to Mrs Elizabeth Gerner, librarian at the time, for her untiring efforts in selecting and cataloguing the 1,000 new books allocated to Walpole. 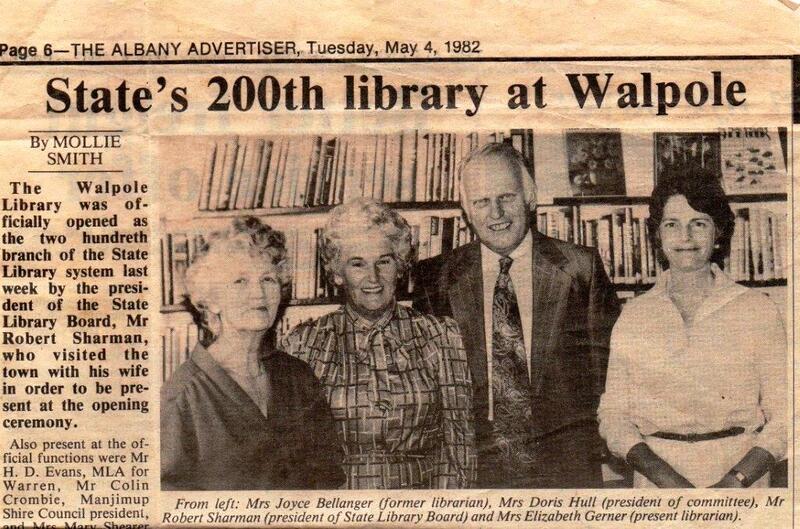 Mr Sharman said that Walpole was fortunate to have the services of such a highly qualified librarian as Mrs Gerner. This post is based on Molly Smith’s “Looking Back with Molly” column, which appeared in the July 10, 2015 edition of the Walpole Weekly.